In this chapter, Hess considers Suzette Mayr’s postmodern Canadian novel The Widows as a significant exception to the “hypervisibility” of young, chic, lesbian women during the 1990s. The author explores the novel’s revisionist approach to history via the trope of the “ghosted lesbian,” which she engages to highlight the narrative’s exposure of the label “widow” as one that has historically overwritten and obscured women’s non-normative life courses. 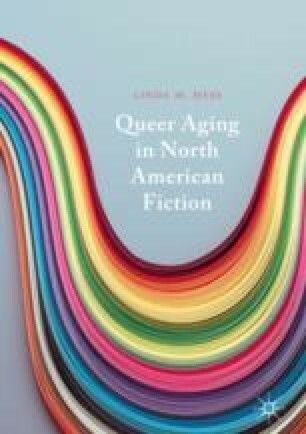 Hess argues that The Widows redresses older women’s historical invisibility by centering its narrative on three septuagenarian and octogenarian women who come to insist on their personal agency, sexual desire, and visibility, and by envisioning a lesbian feminist legacy that stands in opposition to heteronormative forms of inheritance and generativity. Shales, Tom. 1997. Ellen’s Night Out. The Washington Post, April 30. https://www.washingtonpost.com/archive/lifestyle/1997/04/30/ellens-night-out/c74599e9-10cb-4eba-a9ee-7415f54f4ceb/?utm_term=.5a82038d8d84. Accessed 3 Aug 2015. Wilson, Jean, and Nicki Thomas. (2008) 2016. Jane Rule. The Canadian Encyclopedia. www.thecanadianencyclopedia.ca. https://www.thecanadianencyclopedia.ca/en/article/jane-vance-rule/. Accessed. 12 Jan 2018.